Do you find it difficult to manage your hectic mornings? Well, you’re not alone. However, you shouldn’t use it as a reason to start your day with the worst mood ever. Instead, you can think of a good solution to better start off your day with a smile and positive outlook. This is where Morning Kit (Alarm & Panels) comes into play. Morning Kit (Alarm & Panels) is a smart alarm and productivity application for Android tablets and smartphones. It supports both landscape and portrait screen orientations. The aim of this app is to help you start your day – the smart and hassle-free way. It features a panel matrix wherein you can view the most essential information that you need to start your day. This includes the time, date, world clock, news, inspiring quotes, exchange rates, events, notes, photos, date countdown, climate temperature and even the latest weather update. That’s not all. The app will also allow you to set up customizable alarms that will surely help you wake up on time and get ready for school/work. Morning Kit (Alarm & Panels) offers a great way to start your day. Before you sleep, you can set up the app in such a way that it would be the first thing that you’ll see whenever you open your phone or tablet right after you wake up. As I’ve already mentioned, this app uses panels to show relevant information that could help you manage your hectic mornings. 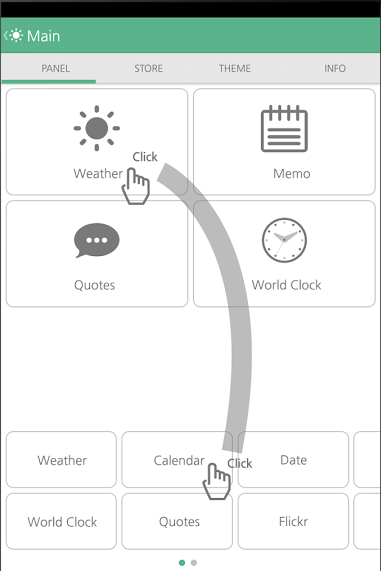 Each panel is customizable so it’s up to you to choose the information that you would like to display in each panel. On one panel, you can display your calendar of events while you can display some inspiring quotes on the other. It’s totally up to you. After all, it’s meant to fit your lifestyle. Just remember that if you’re using the free version of the app, then you can only use up to four panels. In addition, Morning Kit (Alarm & Panels) will also allow you to set up custom alarms. 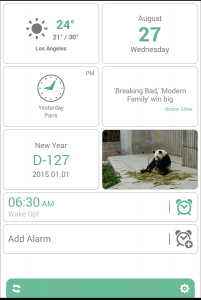 With the free version, you can set up a maximum of three alarms. You can also repeat and change the label of each alarm. Aside from this, the app also lets you choose your preferred alarm tone. Appearance wise, I like the fact that the app supports customizable themes. Plus, the choices aren’t just limited to one or two themes. If you want a more feminine design, you can set the theme to “Mint Pink”. If you want a more modern design, you can either choose Slate Gray or Cool Navy. 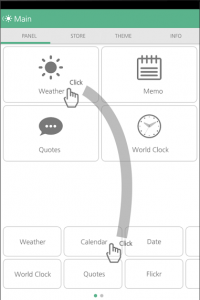 The app also uses simple swipe gestures to carry out certain actions such as swiping the alarm strip to the side to delete. Functionality wise, the app is very stable and responsive. It also doesn’t have any notable bugs or glitches. Just keep in mind that Morning Kit (Alarm & Panels) comes in two versions – the free version and paid version. Plus, it also offers in-app purchases. So, basically, you can expect that not all of its features would be available for free. On the lighter side, you don’t need to fully upgrade to the app’s paid version just so you could opt to add more panels. You can actually pay for each feature separately. It’s a good option for users who simply want to opt out from ads as well as those who simply wish to get more panels and alarm slots. All in all, Morning Kit (Alarm & Panels) can provide users with helpful and relevant tools to start their day right. It is a very good app for anyone who is having difficulties in managing their hectic mornings. Its free version might have limitations but it also won’t cost you much to upgrade to its paid version. So if you’re looking for ways to adjust to your hectic lifestyle, I highly recommend that you give this app a try.